A great day! published on March 12, 2010 Read more posts by the author of A great day!, JentimkoNo Comments on A great day! 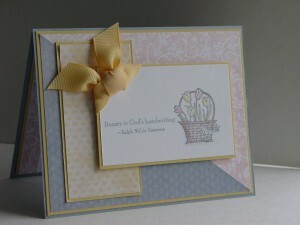 My thanks to the OCC Stampers for choosing me as their Featured Designer! Thanks for visiting! the brave heritage of the women who gave their lives. Yep, in 1944 they were told that their contributions would not be forgotton. But forgotten they were. Now, over 65 years after the Women’s Airforce Service Pilots (WASP) were disbanded, they were awarded the Congressional Gold Medal!! Finally! It is not because they looked for glory but because they answered their country’s call. They paid their way to training and, after selfless service, paid their own way home when they were done. They passed around a hat when one of their sisters died to ensure a proper burial. They were (and are) proud, brave pioneers that paved the way for many who have followed in their footsteps. On March 10th, my son and I were there at Emancipation Hall in the Visitors Center of the Capitol Building. The crowd was standing room only and the pride in the Hall was touchable. Our country’s Congressional leadership stood up and told the story of service, professionalism and heroism. Sen. Kay Bailey Hutchinson talked about this being one of the final steps of recognition, likening the WASP to the Tuskegee Airmen and the Code Talkers. Others talked about this being long overdue. Almost too long overdue since only about 300 of the 1,074 are still alive. But the day was not about regret. Instead it was a day of thanks and tribute…beautifully done. I was privileged to be there. 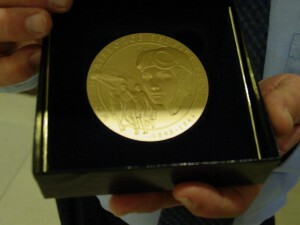 The medal itself is fantastic and I am so proud of my Aunt Frances for earning it!! 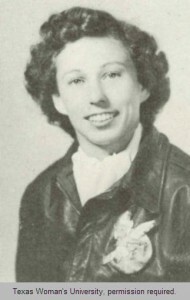 Frances Rohrer Sargent was in WASP class 43-W-4. After training, she was assigned to Camp Davis Army Air Field, Holly Ridge, NC. She mostly flew tow target missions. An enlisted man would reel out a long sock of muslin on a cable as a target for antiaircraft gunnery practice. She was checked out in 10 different kinds of aircraft. She also did searchlight practice missions which were very disorienting for the pilots. More on this is available in the book Women in the Wild Blue in her own words. This is her WASP graduation photo. Records are kept on the WASP, including oral histories, by Texas Woman’s University. I owe at great deal of thanks to my cousins for helping my son and I attend. Here is one of the cards I made for them. I started with the Pals Paper Arts challenge 33 using the colors Garden Green, Certainly Celery and Kraft. 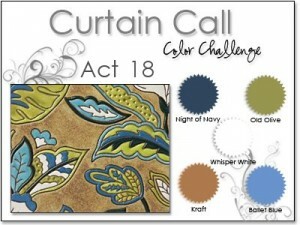 Using these colors means that it also meets the Stampin’ Royalty “Green” challenge criteria. I used the OCC Weekly Sketch number 6. This uses some retired items but I still love the set Branch Out and it will stay with me as a favorite for a long time! We have a cloudy day so the colors are not quite true. The leaves are Celery and Garden Green. 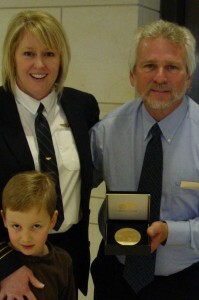 Next, my son and I with my cousin and the medal! I hope you can, in some way, share in my excitement over this great event. Thanks for stopping by!! Passionate about flying! 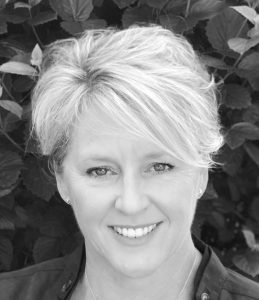 published on March 9, 2010 Read more posts by the author of Passionate about flying!, JentimkoNo Comments on Passionate about flying! This card is for a very special woman, my Aunt Frances. Tomorrow, March 10th, is a proud day for the United States. We are finally honoring a group of women who answered their country’s call during WWII. They are called the WASP, Women’s Airforce Service Pilots, and my aunt is one of them!! Tomorrow, one of my sons and I have the priviledge of going to Washington, DC to see these women get a Congressional Medal of Honor, one of the two highest honors that can be given a civilian. I know you came to see the card but please stay for the history of these great women. I’ll give you the card first. I used the phrase from Inspired by Nature because it sums up my aunt. 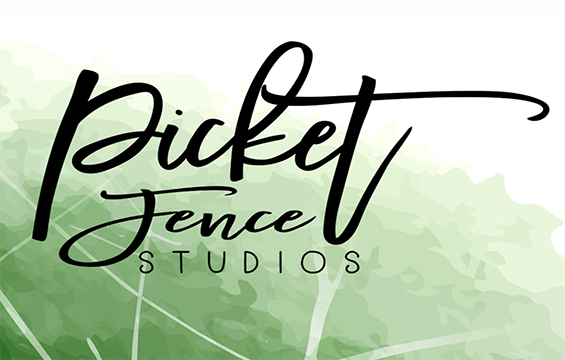 The sketch is from Makeesha over at Inkspirations. I knew it would be perfect with the butterflies and flying is, after all, the theme! The colors came from a color challenge at Splitcoast, CC261, and are Melon Mambo, Certainly Celery and Bashful Blue. These were hard colors for me but they are such a happy combination! Of course with the butterflies and these colors, it feels like spring and meets the Spring Theme from Pals Paper Arts this week (hopefully I meet their deadline). I used some Celery DSP from a hostess pack (I love that it had a butterfly, too). The butterflies from my Big Shot embosslit, Beautiful Wings, are the star of the show. 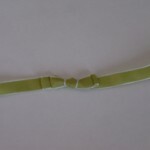 I added a Celery button from the Sherbet set and the new Celery satin ribbon to finish it off. The WASP were formed around 1943 (there were precursors that were joined together) in order to train women to fly military aircraft. This would allow the men to be moved into combat duties while the women would do ferry flights, target and spotlight training and other “behind the lines” jobs. When applications opened, over 25,000 women applied for the job and only 1,830 were chosen. Of those, 1,074 earned their WASP wings. Most of the training was done in Sweetwater, TX at Avenger field. After getting their wings, these women flew almost everything in the inventory at the time! While they took the military oath, they were not given military privileges. In fact, when a WASP was killed in duty, she was not allowed even a flag on her coffin. After the WASP were disbanded, the files about them were sealed and classified…almost as if their flying had never happened. It was only when the US was about to start training women to fly in 1977 that these files were unsealed and the WASP were given veteran status. Tomorrow, our country will finally thank them properly for serving their country in a time of war. It is only because of these ground breakers, and other early women pilots, that I had all the opportunities to fly in my career. Thanks for staying for “the rest of the story”! I appreciate any comments, as always! I was also thrilled to see that the Pals Paper Arts Challenge this week was a theme challenge. Spring!!! Yep, my last few posts have been borderline obsessive about spring so it is nice to know some others are celebrating it too! The birthday girl is turning three so I went back to the Sweet Sunday Sketch Challenge #58 with the three little squares. My first card with this sketch made me so happy that I wanted to try another. The end result doesn’t look too much like a card for a 3 yo, I’m afraid, but I know her mom will appreciate it (she is one of my loyal group of stampers!). I turned to the Lovely Flowers stamp and DSP again since Marie’s picture had the colors from that paper. And yes, I have made two Rich Razzleberry cards in a row. My color palette must have officially switched to spring! For some reason, the watercoloring looks washed out in the picture but I can’t seem to get better lighting today. Thanks for dropping by…hope you have a great day! Today I had the time to sit down and make a card “just because”. No intended recipient, no class, just because I felt like it! Yea! Of course, I’m sure I will use something from it since I am starting to plan for a watercoloring class in April. I went to the Splitcoast sketch challenge for today, SC270, and it was really interesting. I wasn’t sure how I felt about the panels having the asymmetry. Once I started with it, though, I found it easy to work with! I had some scraps from my Lovely Flowers DSP (hostess) that were crying out to be used…another bonus of this layout!! Now, I must confess that the reason I had scraps of the Razzleberry paper was because I had used the fun dots on the other side. Razzleberry hasn’t been my most used In Color this year. But, seeing that I seem to have Seasonal Stamper’s Disorder (SSD)*, the purple was suddenly really appealing to me. 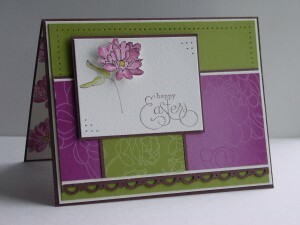 Purple this time of year does seem to demand an Easter card so here we are!! I stamped the flower from Lovely Flowers in Stazon on Watercolor Paper and then used my blender pen to color it with Crushed Curry and Rich Razzleberry. On the strip with the DSP, I originally only had the DSP on the Chocolate Chip. 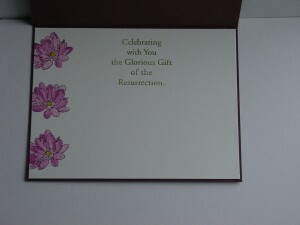 As I looked at the card, it just seemed a bit dark. I put in the Very Vanilla layer, used the SAB border punch and that seemed to do the trick!! I also divided up the panels with small strips of Chocolate Chip card stock to give them definition. The entire card still seemed to be missing something so I naturally turned to ribbon!! Unbelievably (because for me, ribbon usually fixes everything! ), it just didn’t provide the balance I was looking for so I dug out my paper piercing tool and my mat pack and voila! Of course, I wanted the inside of this card to be special, too. I had just the perfect word set!! The retired SU set, Glorious Gift, has been well used every Easter since I got it. Easter truly is a glorious gift from God! I set the words off with a few more watercolored flowers and I feel like the card is as special as the holiday. I hope you think so, too! Thanks for stopping by! * Seasonal Stamper’s Disorder – The tendency to change color favorites with the seasons!! As promised, today I’m going to do a tutorial on one of the bows I use a lot and a corner treatment. The theme of today’s tying lesson is non-square knots! 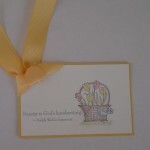 As you know, square knots (left over right, then right over left or vice versa) lead to such pretty cards. Today, however, we will make ugly knots! They have a purpose, though, and the ugly part get covered up. So grab some ribbon and let’s get started!! First decide the size of your bow. 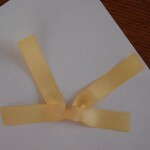 Wind the ribbon back and forth: three times for a single bow, five time for a double. The first picture shows the single, the second shows the double. Click on any picture to see it larger (sorry they are a bit blurry…still learning how to take good tutorial pics). 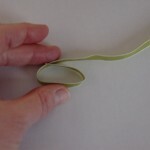 Cut your ribbon and set aside (you’ll have to fold it again in a minute). 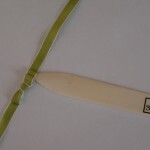 Cut a second length a bit longer than the paper layer you want the bow to tie around. Put the second layer down flat on your work surface, refold the “bow” and place it face down on your straight piece (the bottom becomes the front of the bow). Now, start tying your knot except it will NOT be square. In my case I tied it left over right then left over right again. You’ll see that the knot is not pretty to look at. The reason you do this is to get the tying section to run parallel to the bow. If you do a square knot, it will be perpendicular (that can have its uses, too). If it doesn’t lay just like you want, you can turn one of the long pieces over to see if that helps. 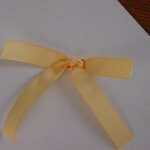 Now flip the ribbon over and you have your bow. 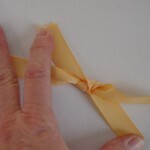 Use your bone folder to “fluff” up the bow as desired and put it on your card!! Of course, now that I have this bow I had to make a card for it!! I used the Mojo Monday sketch challenge 127 again to make this fun little card. I really do love this layout!! Since the ribbon is Old Olive, the rest of the colors were inspired by the Color Throwdown challenge CTD81. They chose Olive, Brown and Pink/White this week. So pretty together! This one is even easier. 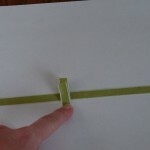 First, cut a generous piece of ribbon for your corner. Cut a second, larger piece (mine was about 9 inches). 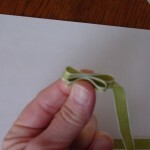 Using the larger piece to tie, make another “ugly” knot. Both ends will easily go one direction (see the next pictures). Just flip the ribbon over and the other side is pretty!! Yea!! Using Mini Glue Dots, attach the knot to where you want it to be on your card, then tuck the ends under and secure with additional Mini Glue Dots. 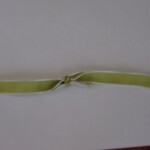 You may have to pull and adjust the ribbon a bit to get it just like you want it (this is true with the bow, as well). Once it is on your card, trim the ends. Easy peasy!!! If you have any questions, let me know and I’ll try to clarify them! Thanks for dropping by to visit!! Oh, and don’t forget to let me know if you try it. I’d love to see your cards! Where, oh where, is spring?? Where, oh where, is spring?? published on February 24, 2010 Read more posts by the author of Where, oh where, is spring? ?, JentimkoNo Comments on Where, oh where, is spring?? You found at least a little breath of it here!!! With the forecast of more sn#@ (it has become a bad word), I had to pull out all the stops for a spring card!! I realized that I am sadly short of pretty pastel paper (soon to be fixed, I can assure you) and had to go searching for some retired items. Well, it was one of my resolutions to actually USE some of the beautiful things I have… Plus, I really wanted to use my new set, A Flower for All Seasons, that I got FREE with Sale-a-bration benefits. 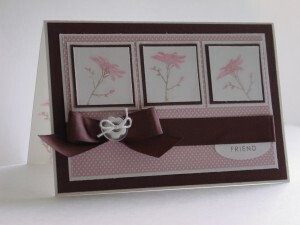 Yes, SAB is still going on and you, too, can get lovely free things from Stampin’ Up!! I have to admit that I am not much of a pink kind of girl, but with Bordering Blue and Saffron I love it!! Besides, who doesn’t love pink tulips??!! Don’t forget, you can click on the card to see it larger. I used the sketch layout for this week from Splitcoaststampers, SC269. 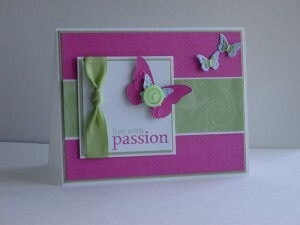 I love the triangle cut and how it lets you add more color to your card! 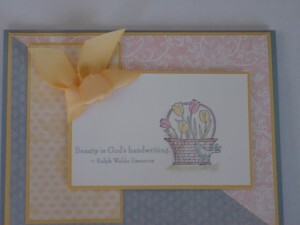 I used my Stampin’ Pastels and a blender pen to watercolor the design. It seems like every spring, when my tastes turn to pastels, my chalks are the first thing that comes out. 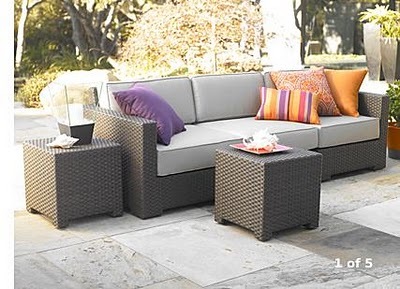 Hmm, sort of like the first robins of spring….yes, I digress into wishing for spring again! At least with my Stampin’ Pastels I am guarenteed to have all of the 48 SU colors right at my disposal!! 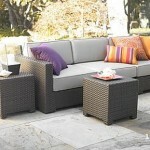 The phrase from God’s Beauty (a retired hostess set) seemed just right for how I feel. The onlything left was ribbon. I did change the sketch a little and skipped the horizontal band across. The little corner knot finished the card up nicely. Well, I have had a request to do a tutorial on tying the bow like in the post below, so come back Friday and I’ll have a post on that one and the corner knot! As always, thanks for dropping by! 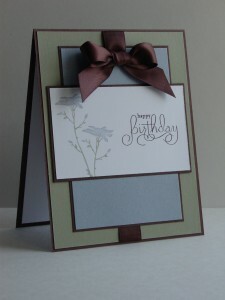 Happy Birthday, Stampin’ Addicts!! I’m thrilled you stopped by for the Birthday Blog Hop!! 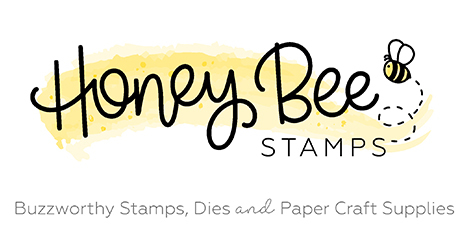 Stampin’ Addicts is one of my favorite sites and a go-to place for tons of creative ideas! I’m stop #20 so if you have missed any, please go here to see all the links. 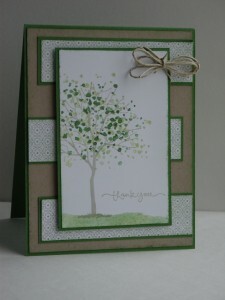 For those coming over from Kandi’s blog, My Sweet Stampin’ Spot, weren’t you completely wowed by her fabulous “green” ideas??!! My theme for this hop is “limited supplies”. All stampers have to start somewhere and many don’t have tons of accessories (yet!). 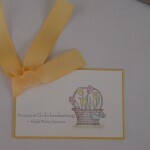 My goal was to use basic card stock, stamps, ink and only one extra item. I find that I lean on designer paper a lot for my stamping and it really sparked my creativity when I went back to basics! Don’t forget, if you click on any picture, you can see a closer view. My first card showcases the lovely Hostess set, Of the Earth, and some of my favorite colors. 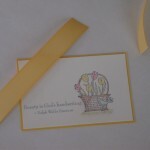 The simple addition of Stampin’ Up’s new satin ribbon (Occasions Mini) really makes this card special! I’m in love with the Well Scripted word set, too. The framing effect of the Chocolate Chip card stock steps up a simple layout. 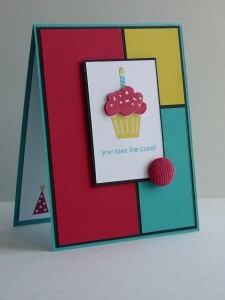 Color blocking is another wonderful way to add some “wow” to a card. I love how the Basic Black layer really makes these colors pop! I cut a second cupcake top and put it on dimensionals to add additional depth and added a Real Red corduroy button. Such an easy card to put together and I love the strong colors with this set (Party Hearty)!! Well, I said it at the beginning, I LOVE designer series papers! Since I couldn’t use them…I created my own! 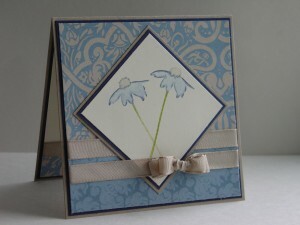 And because I created my own, I was able to make a card in two colors that have sat dormant in my stash for far too long. I really love the combination of Blush Blossom and Close to Cocoa. 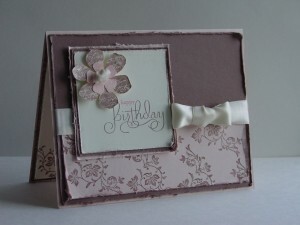 The softness of the colors led me to the wonderful new set Vintage Vogue and the card almost made itself! 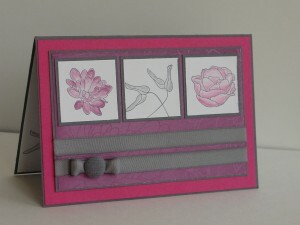 I used the vine to stamp on the Blush Blossom paper and create the texture of a designer paper. I cut out the two flowers and used the Very Vanilla satin ribbon to make the center (the how-to on that center is in my post dated Jan. 20, 2010). It was still missing something and I realized this card had a shabby chic feel to it…so I did a little distressing and here it is! The layout started with a challenge from Stampin’ 411 (SSC138) which I modified slightly. Thanks so much for stopping by! All of these cards qualify for the Pals Paper Arts challenge this week to Keep It Simple, Sweetie (KISS)! Your comments are most welcome and definitely appreciated! Now, your next stop on the hop is a visit to Linda at Olive Stamps. You’ll love her quick and simple birthday cards! Mark your calendars! 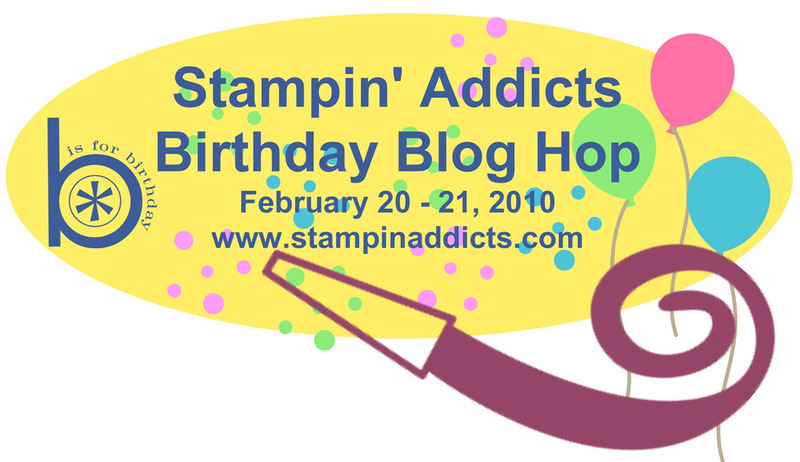 One of my favorite sites, Stampin’ Addicts, is having its first birthday this month!! They are hosting a Birthday Blog Hop featuring birthday themed cards and projects with Stampin’ Up! products. I’ll be joining 24 amazingly talented stamping bloggers in this celebration on February 20th and 21st. Don’t miss this fun event! !